Leila Fortier is a writer, artist, poet and photographer currently residing on the remote island of Okinawa Japan. Her rich interplay of mediums from macro photography to oils, acrylics, water colors, pastels and digital techniques are then layered and arranged to invoke in the viewer a raw emotional experience. Her restlesseness is expressed in her passion to make manifest the formless in what she calls painting emotion. Her art has been featured in tandem with her poetic works, published in numerous literary magazines, journals and reviews in both print and online. 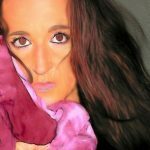 She has been selected to appear as the cover or feature artist of many virtual galleries and publications, including Diverse voices Quarterly, Cave Moon Press, Pink Panther Magazine, Phantom Kangaroo, Zouch Magazine and Moon Milk Review to name a few.